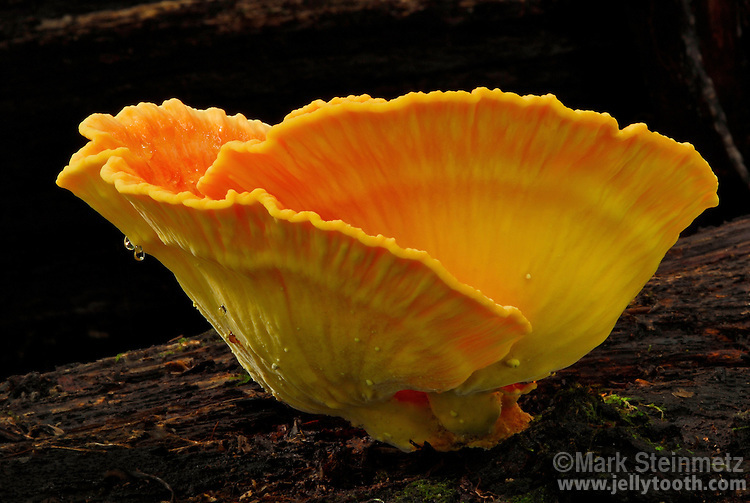 Sulfur Shelf mushroom (Laetiporus sulphureus). This choice edible fungi is also known as "Chicken of the Woods" and is a common and widespread saprobe found on rotting wood in Eastern North America. Often found in overlapping clusters of several to 50 shelfs, sometimes in rosettes, each "shelf" can weigh up to a pound. Stewart Recreation Area, Monongahela National Forest, West Virginia, USA.